VATICAN CITY (CNS) — While people must be honest and specific about their sins when they go to confession, they will miss the sacrament’s key grace if they are “completely mechanical” about listing their sins, Pope Francis said. Confession is not a time for judgment, but for an encounter with the merciful God who is always ready to forgive those who seek pardon, the pope said Jan. 23 during Mass in the chapel of his residence, the Domus Sanctae Marthae. 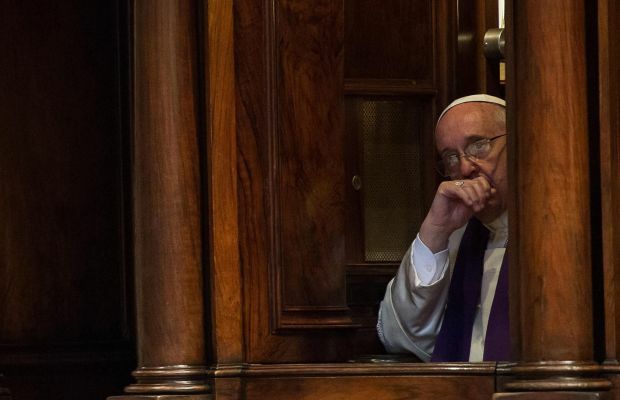 According to Vatican Radio, Pope Francis said parents, priests and catechists need to teach people how to “confess well, because going to confession is not like going to the dry cleaners to have a stain removed. No! It is going to meet the Father, who reconciles, forgives and celebrates” the return of the sinner. “There is no sin that he won’t forgive,” the pope said. Like the father in the parable of the Prodigal Son, he said, most of the time God will not even let you finish saying how sorry you are before he embraces you and forgives you. Pope Francis left something out–One must make a firm commitment not to sin again. If one can’t say that, the confession is void. absolution was unavailable. The serious recounting of one’s sins, asking forgiveness and penance adds up to a process unlike anything else where I may be unburdened. Then, with a clean slate, I may try again to be a better man.